twi-star | Nail Art Blog: Bliss Kiss Simply Smooth Negative Space nail art - Mani Swap! Bliss Kiss Simply Smooth Negative Space nail art - Mani Swap! Today I have my first maniswap to share! Reyna, Instagram @reynasnailart asked me to do one and I jumped at the chance. She wanted to recreate my Floss Gloss basket weave mani, see my original HERE. 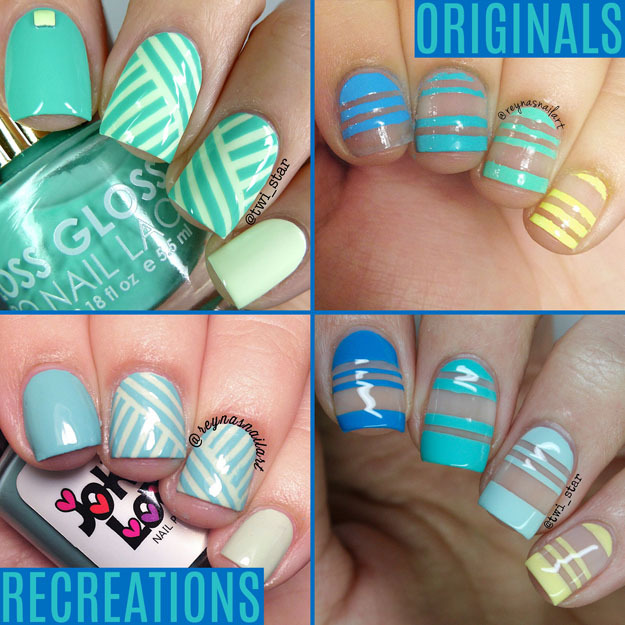 She posted a super cute negative space striping tape mani that I recreated. Check out our collage! Aren’t we so cute lol Thanks to Reyna for letting me use the collage she made. The originals are on top and recreations on the bottom. Here is a solo-shot of my recreation. I used Bliss Kiss Simply Smooth base coat, since it has a really nice sheer light pink color it makes my nail beds “My Nails but better” haha! It evens out their tone and covers up the slight nail staining I always seem to have. To make the negative space areas I used long skinny vinyls from Vinyl It Up and plain old nail striping tape. The polish colors I used are: Thumb and pointer Julep Annie, Middle Julep Robin, Ring Julep Shelly, Pinky Julep Leila. You can follow Reyna a bunch of ways! My version of her mani came out better than I expected! I’m really loving negative space looks lately, they just have such a fresh feel. Thanks for stopping by! Thanks Reyna! It was so fun doing these with you!